I’ve been waiting years for this book. It’s the stuff you instinctively knew about Bono – his increasingly desperate flirtations with power, his fundamentally conservative and religious motivation, his adherence to neo-liberal and essentially Republican capitalist economic strategies, his old-style crusader’s vision of Africa as another culture to be colonised, blimey even his slimy and unapologetic tax-dodging – all that stuff wrapped up in a grounded, inquisitive, even-handed bookful of research. Bono isn’t just a smug self-deprecating grin and fancy sunglasses; he’s a clever, inspirational man who found himself, as the singer in a band, in a position of ridiculous power and influence. 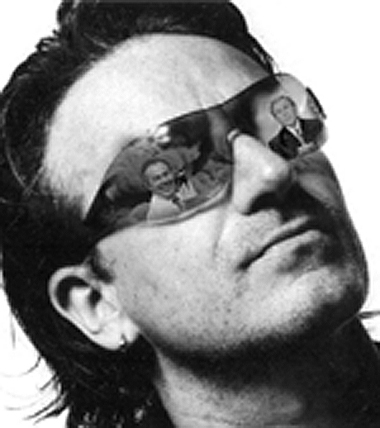 By adopting the messianic trappings of the rock ‘n’ roll frontman, in an age where it became possible to manipulate global media more than ever before, Bono was able to command a huge following that, frankly, politicians were desperate to poach. In the good old days, our rock ‘n’ roll heroes were anti-establishment; this book exposes how rock ‘n’ roll, in the hands of an Irishman with a mullet, became not only a champion of the establishment but its partner-in-crime. This entry was posted on 22 August, 2013 in homepage and tagged Apple, Bill Clinton, Bill Gates, Boff Whalley, Bono, Capitalist economic strategies, G8, George W. Bush, Gordon Brown, Harry Browne, Motorola, Neo-liberalis, nike, The Frontman - In the Name of Power, Tony Blair, Verso. Bookmark the permalink. Is the rest of the review, the bit you chopped out, available anywhere? Would love to read it. Great stuff Boff, more power to you! You won’t be surprised to hear that the media in Ireland has largely panned this fine book, while Spanish and Italian publishers have grabbed the translation rights, what a world. Bono is the epitome of what rock ‘n’ roll isn’t. Nice one Boff..